L-Tron | What is Law Enforcement Appreciation Day? What is Law Enforcement Appreciation Day? Why is it important to show support for the Police Officers & First Responders in your community? Law Enforcement Appreciation Day is celebrated annually the second week in January. This day is used to commemorate, honor and thank Police Officers and First Responders for protecting the community. Law Enforcement Officers have a difficult job to do everyday. Their life can change in an instant, and they put themselves at risk every moment of every day. This year, Law Enforcement Appreciation Day (L.E.A.D.S) falls on January 9th. 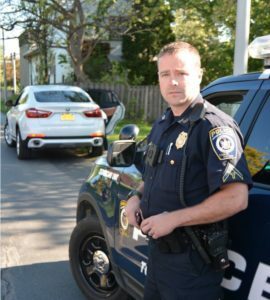 L-Tron’s own Law Enforcement Support team member, retired Sergeant Hank Kula, wrote a piece on Law Enforcement Appreciation Day – and what it means to him. Straight from the voice of Law Enforcement, the gist of Hank’s piece discussed what Police Officer’s really want – to be supported and heard. Hank states “It’s not public displays of appreciation we’re lacking. It’s the current culture lacking an appreciation for what cops do.” Their job is to keep every one of us safe. Click here to read Hank’s blog. [Watch]: We asked our team – What is Law Enforcement Appreciation Day and why are you thankful for our community’s Officers? How can you thank a Police Officer for Law Enforcement Appreciation Day? See what events are happening in your community. In Rochester, the Gates Police Department is participating in the annual National Blue Blood Blood drive. Send a letter to your local department, speaking to your experience with an Officer and how they might have helped you. What is L-Tron doing for Law Enforcement Appreciation Day? At L-Tron, we have several retired Police Officers and Investigators on staff to help better serve our Law Enforcement customers. To recognize our team, the company is generously treating our retired Officers to lunch. We are also (as a team) participating in a local blood drive. Individual employees have shared stories of how they have been affected by local Law Enforcement, and how Officers have directly changed their lives. Questions? Interested in learning more about Law Enforcement Appreciation Day?